As a defender of the Christian worldview, I get involved in many discussions with skeptics. These discussions often not only touch on the existence of God, but on the problem of evil, the nature of man, and ethics, which all overlap into politics during certain years. As many have experienced first hand, these discussions often get heated. There is a temptation that is difficult to avoid in these situations, but it must be resisted. The temptation to become defensive in our attitude (especially when the other person already is) is not easy to avoid. Sometimes we permit ourselves some freedom in our rhetorical force combined with our aggressive posture, and before we know it, those freedoms have produced sarcasm, disrespect, belligerence, or dismissiveness. Many times justified as "passion." 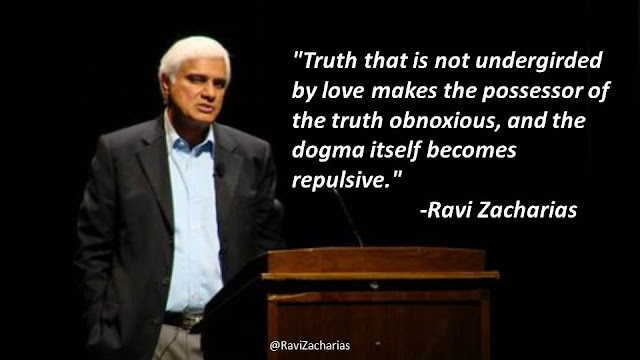 "Truth that is not undergirded by love makes the possess or the truth obnoxious, and the dogma itself becomes repulsive." There are two parties negatively affected by the uncontrolled rhetoric and posture: the defender and the skeptic. The defender is demonstrating the evidences that justify belief in Jesus Christ, yet he does so in a very unloving and unchrist-like way. This creates a contradiction in the defender's life: his actions do not seem to match what he professes. This walking contradiction causes the defender to lose credibility. Hypocrisy in the Church is one of the big stumbling blocks to skeptics. When skeptics see a contradiction in a worldview, they know intuitively that they must question its truthfulness. And if the contradiction includes poor attitudes (as this particular one does), it makes that worldview appear less deserving of a commitment even if it is true. "Being defensive and belligerent always looks weak. Instead, stay focused on the issues, not on the attitude." Love, gentleness, humility, and respect in our discussions will go a long way. Whether we are discussing the truth of the Christian worldview with a skeptic, discussing theology, debating politics, or whatever, if these are not present we have no reason to expect our message to be persuasive. We can compromise neither truth nor character. We claim that Christ can transform lives; we need to allow Him to transform ours so we can be His hands and feet that people can see, hear, and touch in this physical world. I agree in general, but what about Jesus. He was not always warm and fuzzy, at times he was cold and prickly. "White washed tombs" and the temple action come to mind. Thoughts? I agree it is your blog and you make the rules, but I am speaking in general. 1. Do you believe that those two examples were rules rather than exceptions in Jesus' ministry? 2. Do you understand those passages to be merely descriptive of what happened or also prescriptive on how we are to conduct ministry? Would you include the rest of the passages about his peaceful interactions in ministry in that same category? If not, why not? Jesus is an example for believers in some sense. This includes what some may see as exceptions. Rather than seeing them as exceptions, I want to use all that we have in Scripture to understand why Jesus acted as he did when he did, both the warm, fuzzy times and the cold prickly times. My hope is then we can know when to act in appropriate ways. So I do see these passages as prescriptive with a caveat that we need to (do our best to) understand why he responded as he did in the various ways. Jesus was not a loose cannon blasting away at anyone, but he did blast in some cases. Don, I agree that we must take into consideration all of scripture. Since you believe that Jesus' "cold prickly" behavior is permissible for Christian, by what criteria would you propose that we judge if a situation calls for the exception of such an attitude, as opposed to the "gentleness and respect" that Peter articulates as the rule? Also don't forget the Jesus of Revelation. There is a time for everything and we need to discern it. Also remember Jesus as found in Revelation. We need to discern God's will. Yes, we need to discern God's will. But how do you discern when (if) it is God's will to be cold and prickly in a particular discussion? It seems to me that the only times Jesus "blasted" anyone, was when he was addressing the hypocritical religious leaders of his day... which makes me wonder what he would have to say to some of our well-known televangelists of today! These pharisees, sadducees and other religious leaders believed they were on the side of God, and they needed to be jarred awake, not wooed with gentleness. Paul uses similar harshness against the Judaizers in Galatians, going so far as to say "let them be accursed"! Men who claim to lead persons to God, but teach a false doctrine should be addressed directly and forcefully, and their fallacious doctrines rebuked clearly and firmly. The half-truths they spread are too dangerous for any but the most direct rebukes. Terry, indeed, we can be direct and forceful while being respectful. Part of that, though, is demonstrating what we believe to be "false doctrine" actually IS false but also possessing the humility to be shown to be wrong. If we are not willing to be shown wrong, then we implicitly claim to be omniscient and/or infallible, which we, as humans, are neither. We can remain humble, gentle, and respectful and still have truth on our side along with a sound argument to support it. As we defend the truth and show the other person to be incorrect with gentleness and respect, the forcefulness will come from the Holy Spirit convicting them of the soundness of our arguments not from the inflection of our voice (verbal or written). We need to allow God to be the source of the force, for if we are wrong and we try to force the force, the force is artificial and prideful which makes us (and Christ, who we represent) to be foolish. 100% correct. We can (and should) be respectful of the person while exposing fallaciousness of bad arguments, and we should fall in love with truth, and be willing to follow the truth wherever it leads. I always hate to see someone on the internet claiming to know Christ, and spewing crass and ungracious ad hominem attacks all over their posts! Paul wasn't gentle with the Judaizers; however, he DID present evidence to back up his claim to apostleship, the authenticity of the gospel he preached, the truth of his message, and the fallacy of the Judaizer's message. But again, his harshness seems to be due to the extreme danger of their message. To every thing there is a season; for Paul, this was a season to be extremely direct AND very clear about his message. I don't see Paul in Galatians saying, "Now, I may be wrong about this...." Had he done so, he would have watered down the power of the truth. We can't be so willing to reconsider everything that we look like we don't believe anything. Paul stood firmly on what he knew, and presented evidence for that truth. However, he DID demonstrate a willingness to be proven wrong; else, he would not have consulted with the apostles in Jerusalem to confirm that the gospel he proclaimed was in line with what really happened. Bottom line, stand firm on what you know beyond any doubt; hold what you believe, but don't know, loosely and be willing to follow the evidence, and show respect to all, in all but the most extreme circumstances and as led by the Spirit. We need to recognize that Jesus is in a different position than we are. We are not free to function like He does in all circumstances. He has all authority. We do not. We are best served, IMO, to consider the NT passages that His Holy Spirit directed the Scriptural writers as our guides for our communications. So passages such as 1 Peter 3:15-16 and Colossians 4:5,6 instruct us to be gentle, grace-filled, humble, and respectful. Jude instructs us to "keep yourselves in the love of God, waiting anxiously for the mercy of our Lord Jesus Christ to eternal life. 22 And have mercy on some, who are doubting; 23 save others, snatching them out of the fire; and on some have mercy with fear, hating even the garment polluted by the flesh" (vv.21, 22).